Ebenezer Scrooge’s housekeeper, the forbidding Mrs. Dilber, doesn’t often show up in the opening scene of Charles Dickens’ famous Christmas tale. But in A Christmas Carol: A Ghost Story of Christmas, Michael Wilson’s adaptation of the Dickens classic, Mrs. Dilber not only makes an appearance at the start of Christmas Eve, but she utters a pointed warning. Movie-lovers in the audience will be forgiven if the image that springs to mind is Bette Davis and her warning of an oncoming bumpy night. It turns out that Davis isn’t much of a stretch for this Christmas Carol, which goes to great lengths to set itself apart from other tellings of the tale but also leaves a lot of Dickens on the cutting-room floor. Producer Beth Marshall has said she chose Wilson’s adaptation for its emphasis on the four ghosts who keep Scrooge running throughout an action-packed night before Christmas. But even the ghosts get short shrift in director John DiDonna’s 100-minute production, which skims quickly over many of the story’s best-known sequences, dawdles over some others and paints almost all of it in tones so dark that it’s sometimes hard to know what’s going on. The result is a show that, with its elaborate sound design (by John Valines) and its ensemble of cute but awkward children, teeters uncomfortably between professional and amateur. For many in the Winter Garden community, it’s probably a welcome glimpse of the season. But most of the theater people involved here have done far better work. 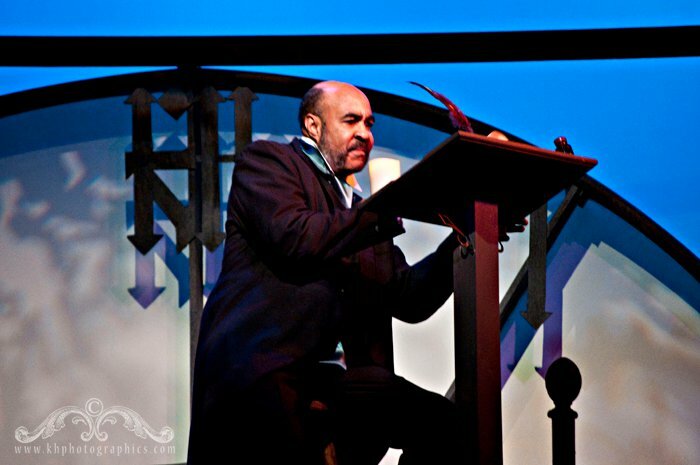 Begin with Wilson’s adaption, which he created in the 1990s as an associate director at Houston’s Alley Theatre. (Wilson went on to become artistic director at Hartford Stage, a job he’s leaving at the end of this season, and to stage Horton Foote’s critically acclaimed Orphans’ Home Cycle in New York.) His Christmas Carol begins in an unorthodox manner – with Scrooge in bed on Christmas Eve morning – and carries on in the same way, skittering over Fan, Belle, the Fezziwigs and even the Cratchits but fixing on a trio of peddlers who add little to the story. In this production the stage seems crowded with all those characters (and with seven small children). Partly that’s because scenic designer Tom Mangieri’s set is dwarfed by a large raked platform that serves as Scrooge’s bed but goes unused most of the rest of the time. But it’s also because the show never lingers long enough with anyone to get much sense of who they are. And the show’s lighting (Amy Hadley was the designer) is so deliberately murky that key elements are often in the shadows. Of course it’s nighttime and the effect is supposed to be ghostly. But it would help the audience mightily if it could see Scrooge’s name on his gravestone – and, even more so, see his face. DiDonna has filled his cast with gifted actors, as he often does, and it’s a pleasure to see many of them turn up even in smallish roles. But most of them have all too little to do. Joe Swanberg makes a frightening apparition as Marley’s Ghost, but he’s not around for long; neither is Samantha O’Hare as a pre-Raphaelite-looking Ghost of Christmas Past. But the Cratchit family is simply not visible enough to provide the show with the heart it needs. And Dennis Neal, one of the finest actors around, makes a Scrooge who comes across as cowed and confused much of the time. There’s little sense of how the night’s events are affecting his character: The production doesn’t take the time to notice. Only when morning comes and Scrooge has had his epiphany does Neal break loose, and, as he fills his character with a giddy glee, you see the benevolent man Scrooge has become. But the man he was is still way too much of a mystery – just as much of a mystery as those all-too-fleeting ghosts. What: Beth Marshall Presents production of Michael Wilson’s adaptation of the Charles Dickens novel. Where: Garden Theatre, Garden Theatre, 160 W. Plant St., Winter Garden. When: 8 p.m. Thursdays-Saturdays, 2 p.m. Sundays, through Dec. 19 (also, 8 p.m. Dec. 13). Running time: One hour, 40 minutes (including one intermission). Cost: $24 general, $20 seniors and students, $10 ages 12 and under on Thursdays and Sundays. 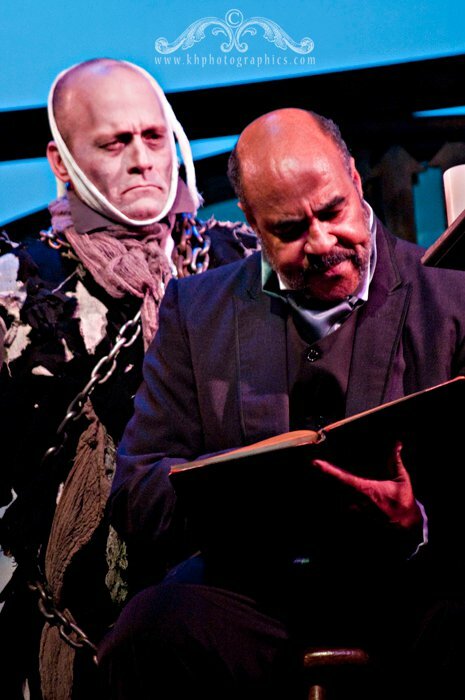 Photos: Top left, Dennis Neal as Scrooge. Middle left, Joe Swanberg as Marley’s Ghost and Dennis Neal as Scrooge. 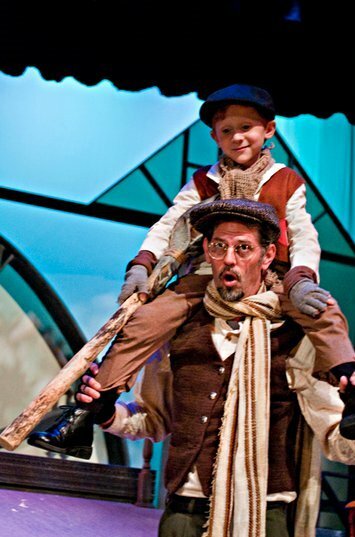 Middle right, Jason Zavitz as Tiny Tim and Cory Boughton as Peter. Middle left, Samantha O’Hare as the Ghost of Christmas Past. 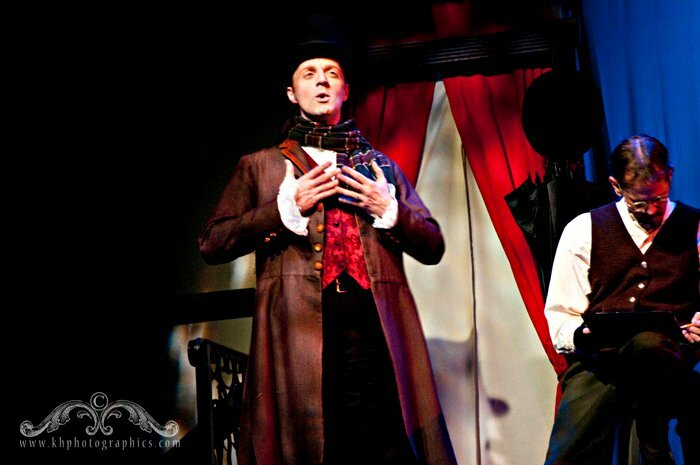 Middle left, David Almeida as Fred and Mike Lane as Bob Cratchit. 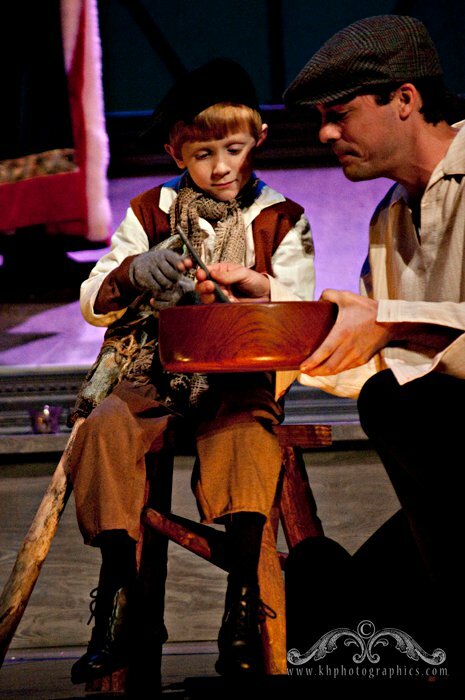 Bottom right, Jason Zavitz as Tiny Tim and Mike Lane as Bob Cratchit. All photos by Kristen Wheeler. 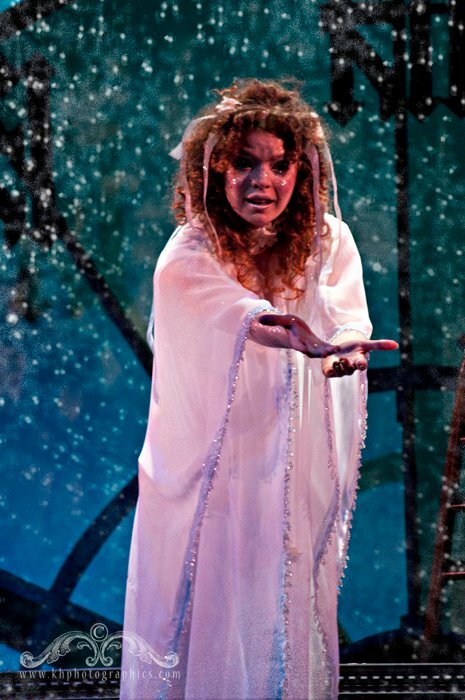 This entry was posted in Orlando theater, Reviews, Uncategorized and tagged A Christmas Carol: A Ghost Story of Christmas, beth marshall presents, Bob Cratchit, Charles Dickens, Fezziwig, garden theatre, Michael Wilson, Scrooge. Bookmark the permalink. As always thank you so much for coming out with us! A Merry Christmas! Went to Thearte Downtown this past weekend to see A Christmas Carol. It was outstanding! The cast was terrific and they kept true to the telling of Charles Dickens tale. It was a real treat! All of our friends and family who went to see it loved it and are still talking about it. If you haven’t treated yourself to this play, please do! It was just wonderful! Jim, I find it a bit offputting that you would declare going to another show on the review of another one. Why anyone would do that simply taints the Theatre Downtown show which is always a marvelous one. yikes…jim….i’m with john…that was down right distasteful. creative license is a risk well worth taking…brave choice once again by both beth and john. glad the talent backed you up on this and i am thrilled that our artists don’t play it safe….bravo to you all….or is it brava? what ever it is… theater…or is it theatre is down right interesting ~ and if i could afford to go to every single production (and there are many) i would. I think we are all very fortunate to live among such talented, dedicated people who give so much to make Central Florida a great home for the performing arts. I don’t mean to sound all sappy, so I’ll just simply express my sincere appreciation and gratitude for the joy I’ve experienced through you all. Merry Christmas!